Welcome to this special edition play-in round of Lent Madness 2016 as we mark International Lent Madness Day with purple trumpets blaring. Coincidentally, this monumental occasion coincides with Lent Madness Day at the Episcopal Church’s triennial General Convention in Salt Lake City. Voting will run for 12 hours, from 9:00 am to 9:00 pm Eastern Time with both an online poll and an in-person voting opportunity at the Forward Movement booth on the Convention floor. The winner in this matchup of the Holy C’s will advance to the to-be-determined 2016 Lent Madness bracket. Stay tuned for the announcement of the full bracket on All Brackets Day, November 3rd. We suggest sitting at your computer and hitting “refresh” for the next four months in anticipation of the blessed event. In honor of all the voting at General Convention, we thought (Hanging) Chad of Lichfield would be a worthy contender to face Clare of Assisi as the Church seeks Clare-ity in its discernment on the issues of the day. So, friends, the fate of the initial entrant into Lent Madness 2016 rests in your capable voting (once!) hands. We will share the result sometime soon after the live and in-person polls close. Minions have been acquired to tally the results of the paper ballots in a secure, undisclosed location in the salt flats, which will then be added to the online count. While you wait for the results, perhaps you’ll want to warm up with a cup of coffee from a Francis of Assisi 2015 Golden Halo Winner Coffee Mug or cool down with a pint of your favorite beverage from a Brigid of Kildare 2015 Silver Halo Winner Winner Pint Glass. You may also want to prepare for Lent Madness 2016 by liking us on Facebook or following us on Twitter. Now, on to the most important vote of the week and a brief foretaste of the Madness that is to come! Bede notes that during Wilfrid’s absence, the King of Northumbria became impatient with the vacancy and decided to take further action. Impressed by Chad’s holiness, the King appointed him to take Wilfrid’s place as Bishop of Northumbria. 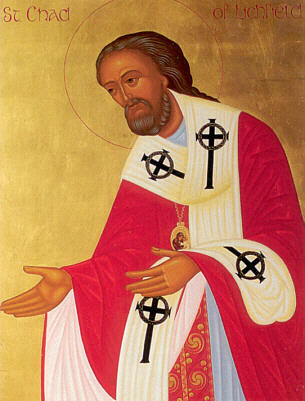 Chad encountered the same problems in tracking down bishops as Wilfrid did; ultimately, he traveled to Wessex, where he was irregularly ordained bishop by two British and one Welsh bishop – none of whom were recognized by Rome. Bede recounts that Chad diligently set himself to the work of administering his see. Later that same year, the King of Mercia requested a Bishop. Remembering Chad’s example of humility and holiness, Archbishop Theodore recalled Chad from his retirement to Lastingham, and had him re-ordained as a bishop. Chad’s humility was most acutely seen when he refused to use a horse to travel his diocese, preferring to follow the example of the apostles by walking. Clare (1194-1253) was born to a wealthy family in Assisi and as a teenager heard a moving sermon by Saint Francis (of Lent Madness 2016 Golden Halo fame). Much to the chagrin of her family, at the age of 18 she decided to take a vow of poverty and follow a Franciscan lifestyle. Her family brought her back by force but she slipped out again and entered a nearby convent of Benedictine sisters. Soon enough Francis gave her and several other nuns both a rule of life and a dwelling built next to the church in San Damiano. They became known as the “Poor Ladies of San Damiano,” living a life of poverty, prayer, and seclusion. In time, two of her sisters, her widowed mother, and several close friends also joined the order. These female Franciscans came to be known as Poor Clares and Francis himself named Clare the Superior. The Poor Clares devoted themselves to prayer and caring for the sick, needy, and marginalized. They also lived a life of extreme poverty — beyond what other female orders had ever experienced. They lived a life of complete poverty individually and collectively; they had no beds beyond piles of twigs, they engaged in hard labor, and begged for whatever food they ate. Clare stood up to various ecclesiastical authorities seeking to impose a less severe rule upon her order. Her strength of conviction defied the norms of female religious orders in the same way Francis faced criticism for his strict and passionate observe of his own faith. Clare and Francis have been linked by their friendship and dedication to the Gospel of Christ. During her lifetime some even referred to her as alter Franciscus, or “another Francis.” Clare tended to Francis during his old age and considered him always her spiritual father. Clare died in 1253 at the age of 59 and her remains are kept in the Basilica of St. Clare in Assisi. Ten years after her death the order she led became known as the Order of Saint Clare. 75 Comments to "Lent Madness 2016 Play-in: Chad vs. Clare"
I’ve never heard of Chad before, and while I love Clare, one reason for Lent Madness is to learn about new saints. I’d love to hear more about Chad simply because he’s such an unknown to me. Chad showed his extraordinary “people skills” by avoiding disobedience and serving where ever he was told. His outlook shows humility and common sense. He also did not complain about following in his brother’s footsteps. Clare disobeyed her family who might well have questioned her grasp of reality. Anyone who insists on sleeping on a bed of twigs is, in all likelihood, is a masochist–not a good example for young women. She could at least havetaken a bed of straw! Only one choice when you worship every week at St. Clare’s in Ann Arbor, MI! Go Poor Clares! Go Clare and GO BLUE! Either y’all are time-traveling or there’s a typo in this post, as Lent Madness 2016 hasn’t happened yet, so how could Francis be the winner of the 2016 Golden Halo? I agree that I look forward to Lent Madness to learn about all sorts of holy people, many of whom I have not heard of before. But this time I had to vote for a long-time “aquaintance”, Clare. I have always admired her dedication to God and her Sisters, as well as her perserverance. Voting for Chad, inspired by his humility and sense of service. Also I live close enough to Lichfield to count him as a local saint and very much enjoyed seeing the St Chad Gospel’s, thought to have been created to adorn his shrine in around the year 730. Had to go with Clare, as we just named a new outdoor worship space St. Clare of Assisi! One would think coming from Florida, the choice would be easy. After all, we have been castigated over the years for our “hanging chads.” But I have always admired Clare and so the choice was harder than it would seem on the surface. I ended up voting for Chad because of his humility and sense that serving God and his people was more important than a title or a position. We will be traveling in Northumbria in two weeks, so that was as good a reason as I could muster in choosing between two worthy people. I say the blessing of St Clare at the end of every service. How can I not vote for her? A bit shocking that Clare has to play for a buy-in: I would have seeded her much higher from the get-go. Chad’s story offers a reflection on episcopal election. I pray for the wisdom of General Convention. Clare too showed great humility, not too mention forbearance , as the church higher ups persistently attempted to force her and her sisters to accept comfortable gentility rather than the life of poverty to which she felt they were called..
Chad’s humility captured my pilgrim attention with his preference for walking as a means for traveling around his diocese. A pity that he died of The Plague. I wonder what he died of, because what we normally think of as the plague (the bubonic plague) was not around in the 7th century. It was, actually; the early Middle Ages saw a number of occurrences of the bubonic plague (the so-called “Plague of Justinian”) , though a genetically different strain from that responsible for the fourteenth century Black Death. I belong to St. Clare of Assisi chapter of Daughters of the King, Estes Park, CO. Of course I voted for Clare. I tried to vote, but the vote button did not function. I wonder why it didn’t. Try to shut the site down entirely, and restart it from scratch. That usually does the trick. The internet elves are sometimes confused. That worked for me when the plain black “Vote” didn’t respond. The “Vote” button works from the provided URL. This was a tough one–Chad appears to be the ultimate in substitutes, not an easy calling, and he handled it with humility. But I have to vote for Clare, who served the marginalized of society and who stood up to the authority of the church. I actually could live with either winner. Wow!!! This is a hard choice. So, I am going with my gut reaction and vote for Chad. Both of these saints are worthy of inclusion in Lent Madness 2016. They are both examples of humility. Chad’s humility is impressive when so many resorted to intrigue, thuggery or worse to attain their bishop position. At the risk of being scorned, I say that humility comes easier for a woman, especially at that time. It’s a hard choice, but I vote for Chad. What a treat to have this special vote!! I had to vote for Chad, he exemplifies what Christ taught us! I am grateful for the memory of pausing close to the remains of St. Clare in Assisi some years ago. A difficult choice, but in light of the election of a new PB this year, Chad’s example of service and humility spoke to my heart. I do love St. Clare, though. May no hanging Chads divert general convention from Clarety. An easy choice . . . finds me in with the winners this time. Rare. Blessings on your good work at Convention. Nice to see Lent Madness in play . . . .
Clare’s simplicity and wisdom are honored by her namesake church in Ann Arbor around this time every year. I have to support the home team. As a first timer, I’m wondering where the tourney goes from here. I love Clare, but I was touched by Chad’s story. I’m going with Chad. After the fiasco of the “hanging chads” and the mess left behind after the slow count in Florida not to mention the aftermath we’re still suffering, I could not in good conscience vote for Chad…sorry, old chap ! So glad to see you back . . . missed you in Lent Madness 2015 and said many prayers that you were healthy, etc. Blessings!! I thought St. Francis of Assisi was winner of the 2015 Golden Halo. Maybe Lent Madness has some foreknowledge of the 2016 elections and for the first time in history a Golden Halo winner is entered in a second race and wins both! I’m sure only the SEC is gifted with such wisdom and vision. I voted for St. Clare because she looks like a poor lady. I can not vote, you need to fix the Vote tab ! I am fascinated by Chad’s story! I wish more clergy (and people in general!) would follow his example of strength through humility!! May Chad’s presence be a real part of this Convention’s work!! Well, I worship at Lichfield Cathedral, so much as I love Clare I’ve got to vote for Chad! I like to think he might have walked right past where my house stands now when the busy road was just a green lane, telling the people he met the good news of the Gospel. I want to vote!! But…you forgot to include a vote ‘button’! Is this a political statement??? My vote goes to Clare…any person who chose to live a life of extreme poverty has earned sainthood in my book. Three cheers for Clare…. Excellent choices. In this time of heightened anxiety and conflict in the Church, Chad’s holiness and humility strike a little closer to my heart. I agree with Lisa above. Humility is rare and wonderful when sincere. Don’t leave Chad hanging! I had to go with Clare because a) she is female and b) because I live in Santa Clara County, and she is everywhere. However, Chad’s story brings to mind the struggles that the Episcopal church in America had to establish itself by going to Scotland to find a bishop. Is it true that some of the name tag holders at the convention are purple and not restricted to bishops? Have they realized the power of Lent Madness instead? How could I vote for anyone but St. Chad since I belong to his church here in Albuquerque. And a very loving and welcoming church it is, too! No brainer – must vote for Poor Clare! Wow, humility vs. humility? They’re both such shining examples. Given the voting for a presiding bishop at GC this week, and given the really shining example of a bishop’s being that humble and able to relinquish power–especially in those far-gone days…I’m leaning toward Chad…but still praying about it! Chad seems like a righteous dude, but as another attendee of St. Clare’s in Ann Arbor, I have to go with her! Thank you for the fascinating Chad and Clare histories. I vote for Chad, who is new to me. The vote tab didn’t work on the email version, but there was a connection that said “View Comments.” I hit that, and the comments, the descriptions AND the voting tab were available. Being resourceful made me think of Chad. I will vote for him. This is an unexpected treat to have Lent madness show up in the summertime! Very interesting reading about both of them – neither of whom I knew. But then … as so often happens, the awful difficulty of choosing. ) : I admire Chad’s humility and dedication, but had to vote for Clare for her serving the needy and as a women standing up to the authorities. I vote for Chad. By the way, I clicked on Vote and nothing happened. Was it supposed to? Vote! button does not work (not even lit) on my email message. I vote for Clare, if it matters. Same problem with the “vote” button. I vote for Clare. I encountered the Lent Madness version of a hanging C/chad when I first tried to vote. The “vote” link would not activate. I had to go a different route (appropriate for Chad who walked on foot to his new diocese) and found a way to vote by clicking the comment button, scrolling to the posting on the email feed, found the voting choices, and succeeded in voting. Thanks for offering two interesting candidates. Wanted to vote, but the button didn’t work. Alas! What a special treat to have a little Lent Madness in the middle of Summer! I don’t know much about Chad or Clare but admire them both. Thank you Lent Madness for introducing me to these two special Saints. I cast my vote for Chad of Lichfield. A no brainer, some of my best friends are of the order of Clare. You do have to be careful when giving compliments while with them. These woman hold no earthly possessions dear and just hand it over to you. As a female priest, I feel obligated to celebrate all those who have been irregularly ordained. Chad is new to me, and I’m impressed by his willingness to serve, and serve, and serve. I’m voting for him. Clare’s story is quite familiar to me, but when I was in Assisi last fall I saw a display of her and Francis’ robes. Clare’s robe does not look like one that would be worn by someone living a plain life! It is a beautifully woven fabric, nicely sewn but it also has large godets (triangular pieces of fabric) sewn into the sides so the hem so the gown is excessively full at the hem.–looks to be 10-12 feet circumference. Overall, the robe is elegant but would be very difficult to work in. I’m a costume technologist, and I do know my clothing history, but this really surprised me. Can anyone provide some further information? Just because it’s an election, I had to go with (hanging) Chad. I wonder who will determine the voter intent on this one? Let’s call him “Chad of Assisi” and see if his numbers go up. Just a little experiment for a theory I’ve developed. Come on people- vote for Chad- he was an obedient servant who was humble- and a servant!! Vote for Chad!!! What a fine example Chad provides. Had to vote for Clare. There had to be something special about her if she was referred to as “another Francis”. Their close friendship and the fact that she cared for him in his old age moved me to push the vote button for Clare. 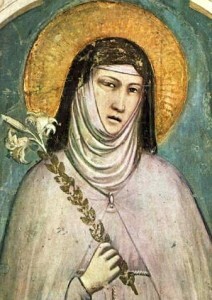 I know St Clare meant well, and was no doubt a pious woman. I find self deprivation and mortification tiresome at best. Give me humble, obedient Chad any old day. I got to my email too late to vote, but in honor of my bishop it would have been for Chad, who walked his diocese. Bishop Doug Fisher is walking our diocese of Western Mass. in three segments; he has two corridors down and the Berkshires to go. If you see him out there in Utah, be sure to say Hi and ask him about his travels! Here’s another too-late vote in support of Chad! I have voted, as you can see, but Sister Mary Winifred wrote that she missed seeing some reply from a “regular” and I surmise it was MOI ! If so, I had quadruple bypass during LentMadness and was totally zonked out, a condition some thought a permanent lifelong state of affairs. Au contraire…always a faithful sane member of the LM diehards. Hats off to Lady Jane in Cincinnati! I would love to vote, but each of the times I’ve tried on my iPhone 6, and my Apple Mini desktop, I have not been able to. (Oops, ended the sentence with a prep…) Please tell me how I can put in my vote.